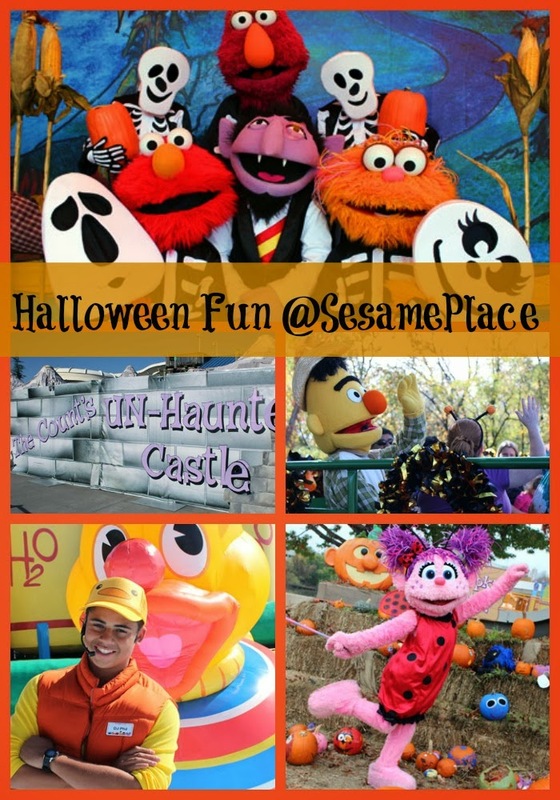 Have you been to Sesame Place for the Halloween Spooktacular at Sesame Place this fall? Saturday and Sunday (October 26 & 27) are the last days to play. Here are some photos from our recent visit. Last #T5Tue, I talked about the difference between a psychoeducational and a Neuropsychological evaluation. Resources for Children with Special Needs - they may be able to suggest someone. 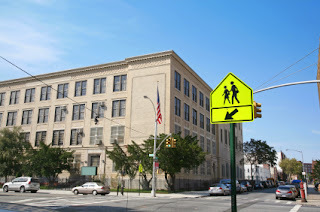 A Parent' Guide to Special Education in New York City - this book provides many suggestions of places to have your child evaluated. Consult with a special education specialist or advocate. Ask your pediatrician, your child's current school or other special needs parents. Word of mouth almost always works for me. They may be able to point you in a direction or give a referral. Do they accept insurance? Or the medicaid waiver. If they don't - will they work with you so that you can submit bill to your insurance. Will they be able to provide specific suggestions? Will the doctor be willing to testify (if you have to go to an impartial hearing)? Ask how they will structure the written evaluation (and roughly how many pages). 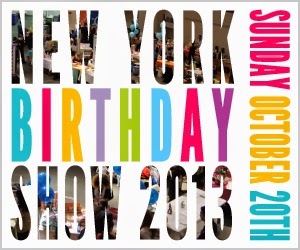 10/24: Special Needs School Fair at the JCC in Manhattan. Register for the event - HERE. Disclaimer: Woodbine House provided me with a complimentary copy of Body Talk: Teaching Students with Disabilities and Body Language for review purposes. The opinions expressed are my own and have not been influenced in any way. As The Boy gets older, personal space has become more of an issue. People are more likely to laugh off a two or three-year-old touching their face. A big seven-year-old touching an adults face? Probably not. The older The Boy gets, the more worried I become. Living in a city like New York, getting in someone’s personal space is the kind of the thing that could lead to serious trouble. Working on personal space has become a goal at school and at home. 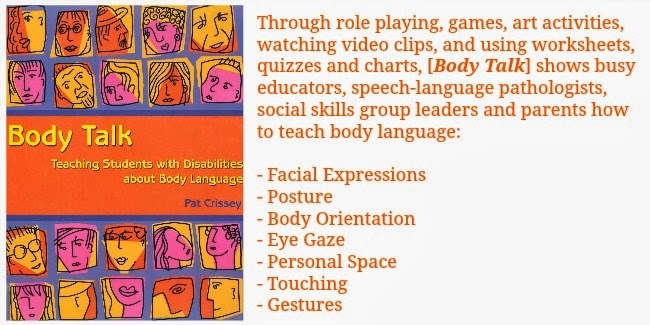 I was really excited about reviewing Body Talk: Teaching Students with Disabilities about Body Language by Pat Chrissey. It’s the kind of book that I know I will return to again and again. Children and teens with autism and other developmental disabilities can be taught the language of nonverbal communication with the practical strategies developed by veteran special education teacher Pat Crissey. More than 100 activities break down elements of body language into teachable components. What I appreciate about Body Talk is that it really goes step by step and breaks down all forms of body language: emotions, facial expressions, posture, body orientation and eye gaze, personal space and touching and gestures. However Body Talk just doesn’t tell you what to do – it shows you. The activities and games are great ways to make learning fun. It’s simple enough to be done at home one on one or in a group setting at school. What’s especially helpful about this book is that it comes with a CD so you can easily print out all the activities. I printed out the personal space activities for The Boy's teacher. The activities vary in age and functioning levels and you can easily modify activities to suit your needs. Body Talk is a must have book if you have a child with autism. And it's a book that will grow with your child from the early childhood years to young adult. 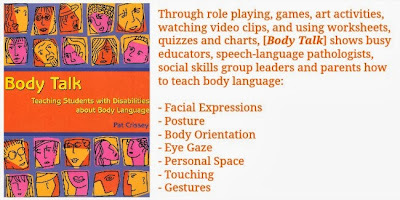 Body Talk: Teaching Students with Disabilities about Body Language is available on Woodbine House for $23.99. Dr. Sanjay Gupta and Everyday Health explores how Minorities are disproportionally impacted by the rising autism rates. With less access, it could drive up healthcare costs for all in the long run. Oh...and I'm also in the video. You can read the article - Autism Strikes Some Families Harder Than Others - on Everyday Health. 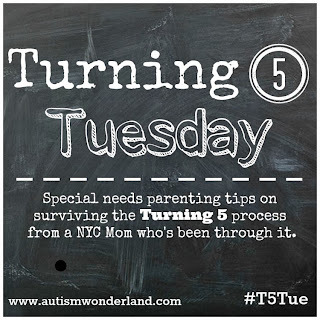 * Norrin was still getting home base (and center base) services from a SEIT (Special Education Itinerant Teacher) between 3 and 5 years old through CPSE (Center of Preschool Special Education). 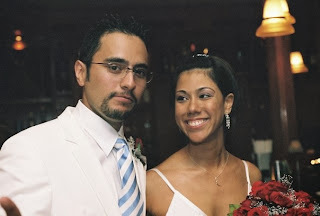 Unlike like our Early Intervention experience where we got really lucky with an amazing therapist, we went through 6 SEITS in 2 years before hitting the jackpot with a really great person. One SEIT quit after 3 days because of parking (she was used to visiting homes, where she could park in a driveway) and another SEIT told me, "my husband has concerns about me coming to this neighborhood." One agency dropped me after I expressed concerns/complaints about a SEIT. * Norrin was placed inappropriately during his kindergarten year. That was the year I had to sue the Department of Education because the school failed to provide an Occupational Therapist. After 8 weeks of paying out of pocket (totaling $1250.00), I was given a waiver letter to continue outside OT services and no longer required to pay out of pocket. The OT was able to bill the Department of Education. I sued the DOE for full reimbursement for the money I spent on OT and later that year, I had to sue again to have Norrin removed from the school. * For the last 2 years we've been paying out of pocket for ABA therapy at home (after school) from an agency called Center for Autism and Related Disorders. We use our medical insurance to pay for this therapy. 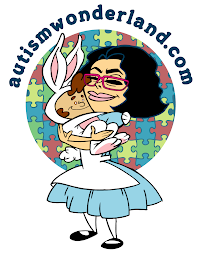 I am very lucky to have a job with really good health insurance coverage (we have an autism advocate that helps file medical paperwork) and thanks to the Affordable Care Act, I live in a state with autism coverage. * Over the last five years, I've read many books that were helpful and inspiring. However, they are predominantly written by white, upper middle class women who were able to either move, hire an attorney and/or quit their careers to stay home with their children. These were not options for me. And reading these books in the beginning, I felt as if Norrin would never be able to "get better" since I could do any of the things I was reading about. I now know better. It's officially a week since 14-year-old Avonte Oquendo has been missing. Last step as I stepped off the 6 train in The Bronx, I paused on the platform to listen to the announcement - it was a message about Avonte. I pulled Norrin's (I usually refer to him as 'The Boy') hoody over his head, the wind was picking up. Every night this week, I've wondered if Avonte's cold, hungry, tired and missing his mother. Every night this week, I've held Norrin's hand a little bit tighter. This story hits too close to home for me. And my emotions are all over the place. Avonte could easily be Norrin in a few years and it's scary to see how easily a kid could fall through the cracks of a broken system. Like Norrin, Avonte was in a 6:1:1 classroom in a Queens public school (District 75). Avonte walked out of his room, down two flights of stairs and passed a security guard. The guard asked Avonte where he was going, when he didn't answer (because Avonte is non-verbal), the guard assumed he was "one of the regular kids." The school took an hour before notifying Avonte's mother, Vanessa Fontaine. The school was absolutely negligent and it's a disgrace. How are special needs parents supposed to have faith in the public school system? For me, it's just another glaring example of how the public school system is ill equipped to work with individuals with special needs. Something NEEDS to be done. I think of Norrin's kindergarten year and how hard I fought to get him out of that public school and away from District 75. And while I love Norrin's current school, still I wonder. Avonte reminds me of how vulnerable we really are. There are so many people I have to rely on - teachers, bus drivers, matrons, baby sitters. Will they be able to keep Norrin safe? Yesterday morning, I saw Avonte's mother on television and I cried. I could see the pain in her eyes and feel her heart ache. 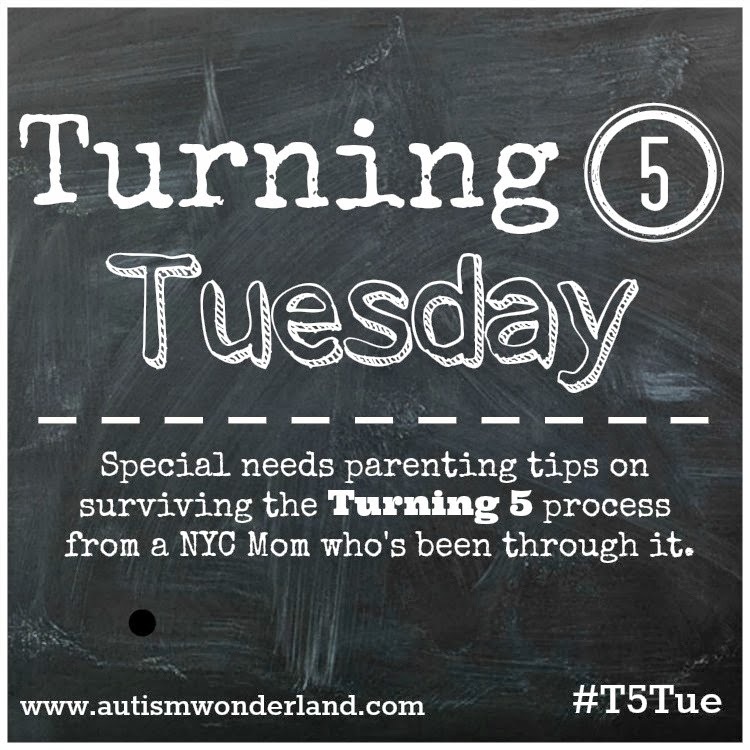 When you have a child with special needs, wandering is your worst nightmare - especially in a city like New York. I don't know Avonte or any member of his family. But I grew up in Queens, I have a special needs sister who went to school in Long Island City. 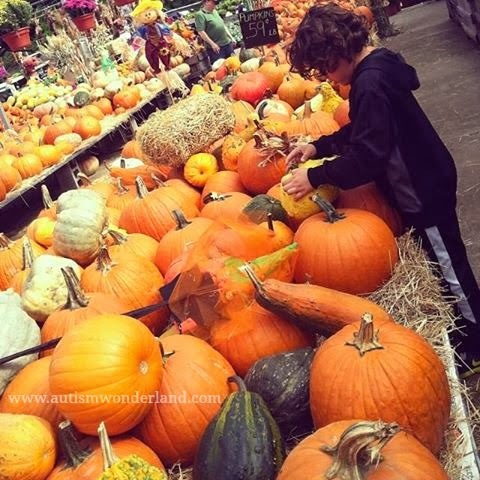 I have a son with autism. This is too close to home for me and I am praying for Avonte's safe return to his family. And I want to do everything within my power to help. 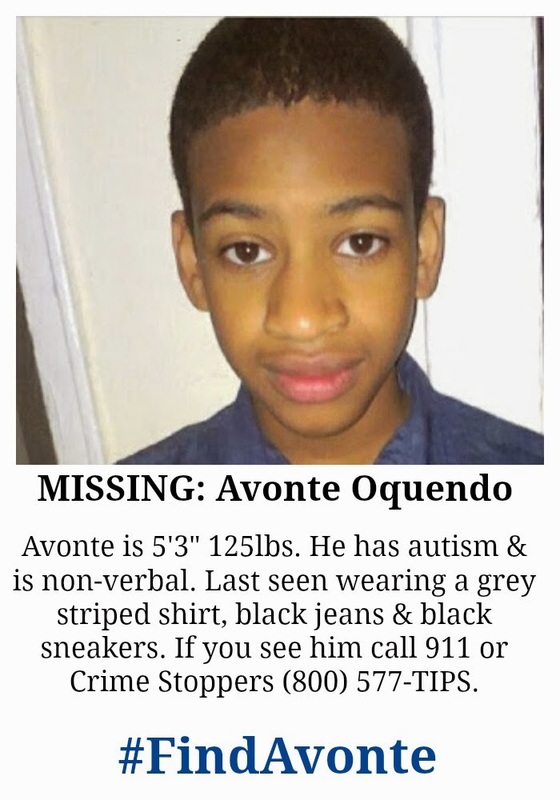 Whenever a white child with autism goes missing, my social media feeds are saturated with posts and tweets. Blog posts are written and shared, hashtags used. There is this sense of urgency. I haven't seen that with Avonte Oquedo. When a brown kid with autism goes missing, the sense of urgency doesn't seem as great. Autism is a spectrum and it comes in every color. All of our kids matter. Avonte could be any of our kids. And I wish that more were being done in the media. New Yorkers often get a bad rap for being rude and apathetic but in these moments - we all really come together as a community. That's what I've seen this week. And that makes me so proud of my city. It gives me HOPE. Hope is all we have right now. Tonight (Friday, 10/11) at 5pm there will be a vigil in Queens for Avonte Oquendo at the tent next to Center Boulevard School in Long Island City.